In photo L-R: Leah Bautista (ALKFI-BNJ OIC), Susan Afan (ALKFI Central Fundraising Director), Katsumi Kubota (Uniqlo Chief Operating Officer), Masayoshi Nakamura (Uniqlo Co-Chief Operating Officer), and Geraldine Sia (Uniqlo General Manager) during the MOA signing between ABS-CBN Lingkod Kapamilya Foundation and Uniqlo. Afan, Kubota, and Sia holding denim products made by the women of Southville 7. Committed to empower women, Uniqlo seals the agreement with ABS-CBN Lingkod Kapamilya Foundation to give livelihood to the women of the community in Southville 7 Calauan, Laguna. Under the partnership are two projects called “Upcycling” and “Recycling”. In Upcycling, Uniqlo will donate scrap denim materials to ALKFI-BayaNiJuan, a program that caters the community of Southville 7. The sewers of the community will conceptualize, design, and create new items out of the given materials which will be bought by Uniqlo to be used as their corporate giveaways. The clothing brand will also provide trainings to the group to ensure a steady supply of skilled workers. 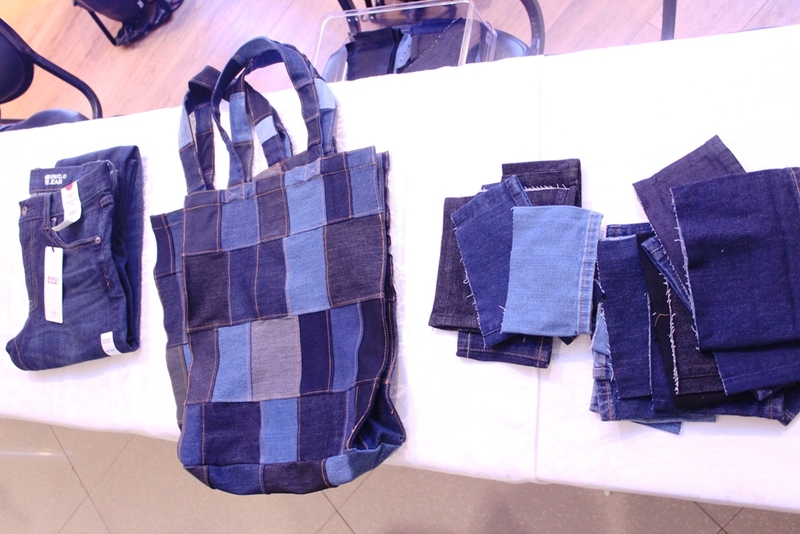 A Uniqlo pair of jeans, a denim bag made by the women of Southville 7, and denim scraps from the altered jeans of customers. For the past five years, Uniqlo has been placing recycling boxes in each of their stores where customers can donate their clothes that they no longer want to use. The collected clothes will be donated to ALKFI, to be used by ALKFI’s different program to their community outreach projects and other related activities. To date, Uniqlo has 24 stores where customers can bring the clothes they want to hand down. By donating, they also become a part of helping the community of Southville 7, and other assisted communities of the foundation.